German historian; born Feb. 5, 1861, at Rastenburg, Germany; died June 29, 1893. After completing the gymnasium course, he entered the University of Berlin, where he studied history, philology, and later went to the University of Königsberg. He was graduated from the latter as Ph.D. in 1883, on which occasion he wrote a thesis, "Studien über die Älteren Angelsächsischen Urkunden." 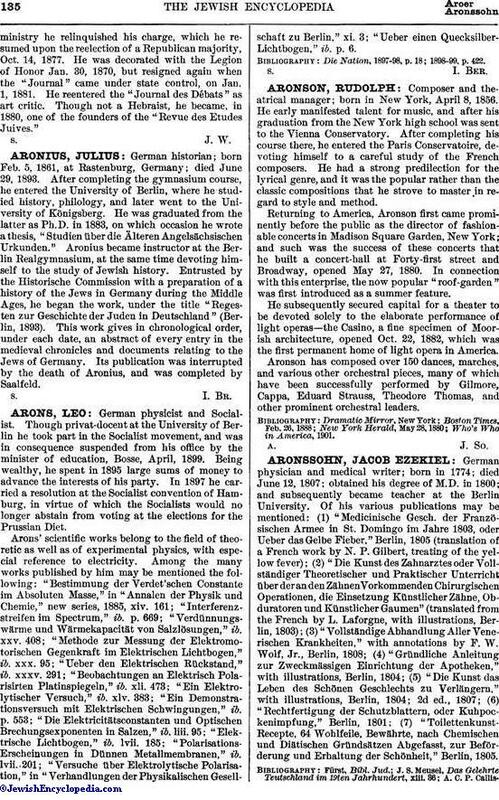 Aronius became instructor at the Berlin Realgymnasium, at the same time devoting himself to the study of Jewish history. Entrusted by the Historische Commission with a preparation of a history of the Jews in Germany during the Middle Ages, he began the work, under the title "Regesten zur Geschichte der Juden in Deutschland" (Berlin, 1893). This work gives in chronological order, under each date, an abstract of every entry in the medieval chronicles and documents relating to the Jews of Germany. Its publication was interrupted by the death of Aronius, and was completed by Saalfeld.